BYD Motors Inc. has officially unveiled the world's first long range, 100% Battery Electric Over the Road Coach Bus. This first electric coach, named the BYD C9, is a two-axle, 40' coach with the seating capacity to carry 47 people at highway speeds for over 190 miles. "The transportation industry is still just warming up to the idea of Battery Electric transit buses," said BYD Coach & Bus Vice President of Sales, Macy Neshati. "It was exciting to walk around last year's APTA Expo in Houston and see so many reputable names displaying an electrified transit bus. However, I don't think anybody thought they would see a viable electric coach solution for a few more years." The BYD C9 is the first of three 100% Battery Electric coaches the company will launch globally this year. The other two, a 45' three-axle coach named the C10 and a 23' coach with executive and transport configurations named the C6 will be arriving by the end of 2015, and BYD sales managers at the 2015 UMA Expo were adamant about the fact they are taking orders for all three of the coaches starting now. 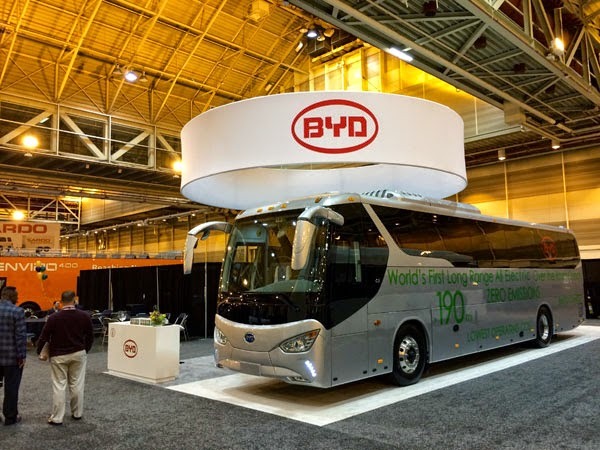 "Last year, BYD pulled away from the competition in the transit space when they launched a 30' low floor bus and a 60' articulated bus in addition to their 40' bus making them the only electric bus builder with multiple offerings. This year the launch of three coach buses puts BYD on a level with no other bus or coach OEM. Not many people know this about BYD but we are a multibillion-dollar company employing nearly 190,000 people worldwide. There simply has never been a bus manufacturer in the United States with this sort of engineering or manufacturing power, that's why I tell every customer I meet with they should go BYD, it's the safe choice!" said Neshati.